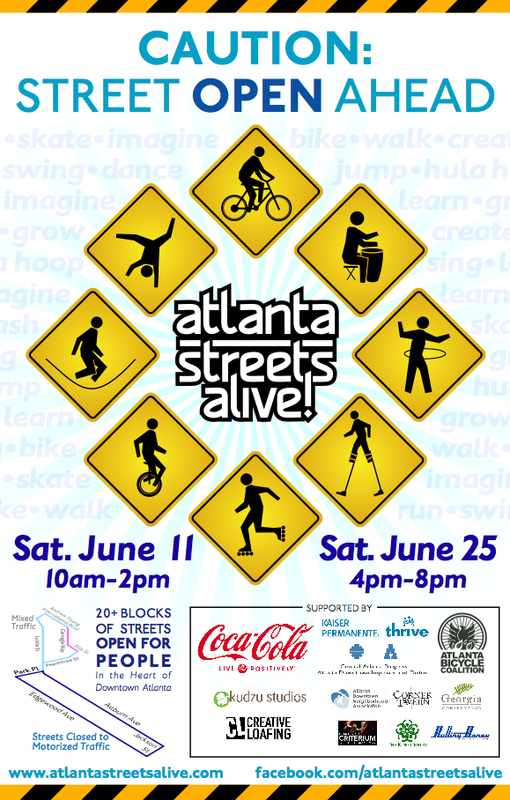 Atlanta Streets Alive returned just over a year later to Downtown and the Old Fourth Ward on Saturday, June 11, from 10a.m. to 2p.m. 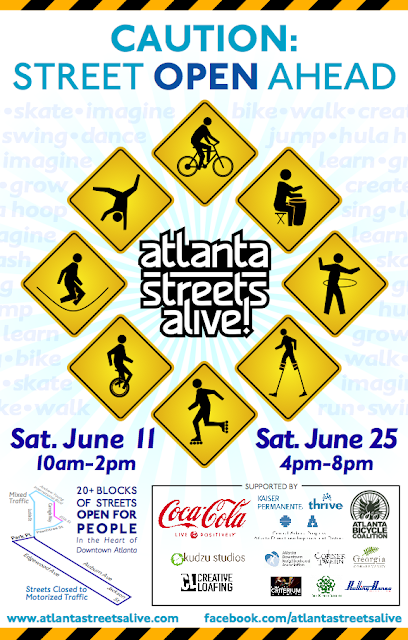 Thanks to a group of volunteers and organizations including host Atlanta Bicycle Coalition Streets Alive took a valuable public space - our city’s streets - and open it up for people to play, walk, bike, breathe, and make their own. I have to say that this is our second time participating at this event and I just LOVED it. People biked, walked, run, skip or cartwheel through our Edgewood and Auburn Avenue loop, from Peachtree to Boulevard, and took part in an array of free activities from over dozens of local organizations – everything from bike rodeos & mountain bike trails, hula hooping, double-dutch, frisbee, relay races, Zumba, capoeria, cheerleading, boot camp, kickboxing, yoga, Pilates, Nia, salsa, flamenco, Persian dance & poetry, free style poling, poi, and circus performers, to storytelling, bubble making, scavenger hunts, camping challenges, street stenciling, art installations, live music (jazz, steam punk, classical, djembes), health living education, and food & drink from the area’s best restaurants. “Our goal is to create opportunities for Atlantans to beat the obesity epidemic by getting active, having fun, socializing with their neighbors, and exploring parts of the city by bike and foot they normally experience from the interior of a car,” says Rebecca Serna of the Atlanta Bicycle Coalition. If you missed this event don't worry. This event will repeat on June 25th. A list of activities can be found on the Streets Alive website.